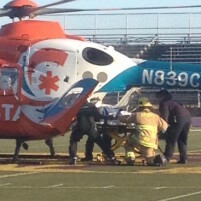 An emergency helicopter landed on the Righetti High School football field in Santa Maria Wednesday morning and airlifted an injured pedestrian to the hospital, according to the Santa Barbara County Fire Department. 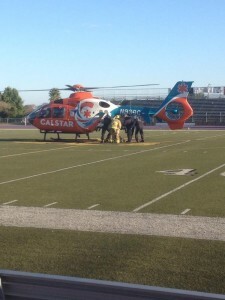 Around 7 a.m., a Chevrolet El Camino hit the teen while she was walking to school. At the time of the collision, the girl was crossing a crosswalk at the intersection of Bradley and Foster roads, just outside the high school. The California Highway Patrol is investigating the crash. Officers say they believe the girl did not see the vehicle. Let’s talk crosswalks. Throughout my childhood, crosswalks seemed safe. Times have changed. In Los Osos (for example), if you attempt to cross Los Osos Valley Road at the corner of Fairchild Way or the corner of Sunset Drive, you may see your entire life pass before your very eyes. Even though the County has installed lights that flash yellow when pedestrians push the button to cross the busy street in the crosswalks, most of the time vehicles do not even slow down, let alone stop! Being a pedestrian is extremely dangerous. The very unfortunate 14-year-old girl who was injured this morning in Santa Maria may have assumed since she was crossing in a crosswalk that she was safe. Please teach your children and young adults to use extreme caution anytime they cross the street. They need to look both ways and proceed with great care. Their lives depend on it and so does yours! What do you expect when driver’s licenses are being handed out like candy. I remember when some people had to take the test a few times and take a few attempts at passing the driving test because it actually mattered how you did. Now you can have your license in just minutes without any real assessment of your ability to read signs or drive. Thank you for getting up on my soapbox! The vast majority of auto accidents do not involve alcohol or phones. Incompetence is the biggest killer on the road. “The girl was crossing a crosswalk and didn’t see the vehicle”…! ! !